After many years of successfully forging market connections among food producers and buyers in the Pacific Northwest, Ecotrust is excited to make its toolkit, Building Local Food Networks, available to organizers who are striving to build local food networks and robust regional food economies in their own communities. 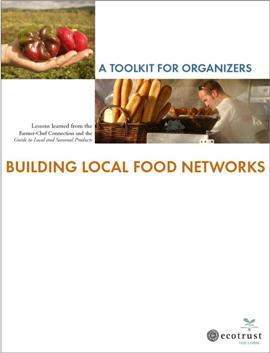 Based on the lessons learned from the Farmer-Chef Connection conference, the toolkit provides specific guidance on organizing a gathering that stimulates the growth of business-to-business networks of food producers and food buyers within a specific region. Extensive appendices provide sample materials, templates, and tools for organizers.